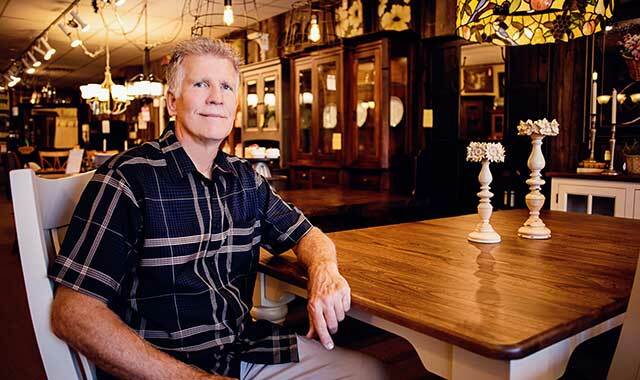 Bob Wozniak, co-owner of Strode’s Furniture, in Huntley, puts a priority on good customer service and well-built furniture made from solid wood. Larry and Ellie Strode opened up their family-owned furniture store in downtown Huntley in 1976. The location put them right where they wanted to be: situated in a smaller town, while still enjoying the benefits of a close proximity to the surrounding suburbs. At that time, Huntley was still a simple farming community of only about 900 residents. Today, Huntley is a bustling suburb of 27,000 people, and Strode’s Furniture, 11707 Main St., is still a staple in downtown Huntley, where it continues to provide a friendly, hometown location for those interested in purchasing quality furniture. The Strodes’ shop still resides in a historical building on Main Street, right off Huntley’s town square. Customers come from Kane, McHenry, Cook and Lake counties, many of them driven to the shop by word-of-mouth from friends and family. Since its start 42 years ago, this store has made a hallmark of working with American-based furniture suppliers – businesses that construct high-quality products from domestically harvested hardwoods. Additionally, Strode’s suppliers tend to use hardwoods procured from forests that are select-cut and replanted in order to promote sustained forestry. Currently, Bob Wozniak and his wife, Cathy, own the business, having taken over from the Strodes in the early 1980s. Like the Strodes before them, the Wozniaks’ dedication to sustainable, American-made furniture and reliable customer service are just a couple of examples of why the company has continued to achieve success over the years. The firm’s eagle-eyed focus on domestic-made furniture has always been a top priority – and that’s not a small feat in these days of cheap imports. Wozniak stands by his American-made furniture because he prefers not to sell cheaper-quality materials, such as particleboard and plywood that often comprise imported products. The products on display in the Strode’s showroom demonstrate high-quality furniture built with exemplary craftsmanship. A number of pieces you’ll find here are made by members of the Amish community. In fact, Wozniak works with about 30 Amish wood shops, and because he works directly with the carpenter, he can easily help customers to find exactly what they’re looking for. If someone is interested in custom-made furniture, Wozniak invites them to bring in a drawing or picture and he’ll get a quote from the Amish wood workers with whom he partners. It’s not just the dedication to high-quality furniture that makes Strode’s stand out. It’s also the fact that this store remains dedicated to high-quality customer service – something else you won’t always find in a big-box store. Here, everyone is treated like family. “We’re a family-owned business, and the grandkids help out on occasion,” says Wozniak. The cozy showroom is filled with furniture ready to furnish someone’s home. Everything from bedroom collections, dining sets and hutches to storage cabinets, TV cabinets, coffee tables, end tables, and a variety of home accessories are staged inside this intimate showroom. What’s not produced by Amish craftsmen is most likely designed and built by reliable, well-known brand names including King Hickory, Marshfield Furniture, Craftmaster Furniture, Comfort Design and Durham Furniture – a Canadian firm that’s one of the oldest furniture companies in North America. As an added bonus to shoppers, Strode’s provides custom furniture consultants who will visit homes to help clients make the right choices. Wozniak and his team additionally maintain connections with several local interior designers who make themselves available for complete home makeovers. Wozniak grew up in Dundee and has been involved with Strode’s Furniture for 39 years. He started as a helper on the floor and eventually moved on to sales and delivery. In 1981, he was presented with an opportunity to become a business partner with the Strodes. Today, he and Cathy are the sole owners. Huntley’s explosive growth during the 1990s and 2000s has presented its challenges for this home-grown furniture retailer, most notably as Wozniak finds ways to stand out from nearby competitors, especially of the big-box variety. But he’s overcoming these challenges by continuing to offer quality products, sold in a different manner than customers are accustomed to. As a small-business owner, Wozniak believes it’s important to care about the customer and follow through on what you say you’re going to do. Where competitor shops may focus on making sales, this is not the case at Strode’s Furniture. This entry was posted on Monday, September 24th, 2018 at 11:58 am	and is filed under Northwest Business Magazine. You can follow any responses to this entry through the RSS 2.0 feed. Both comments and pings are currently closed.